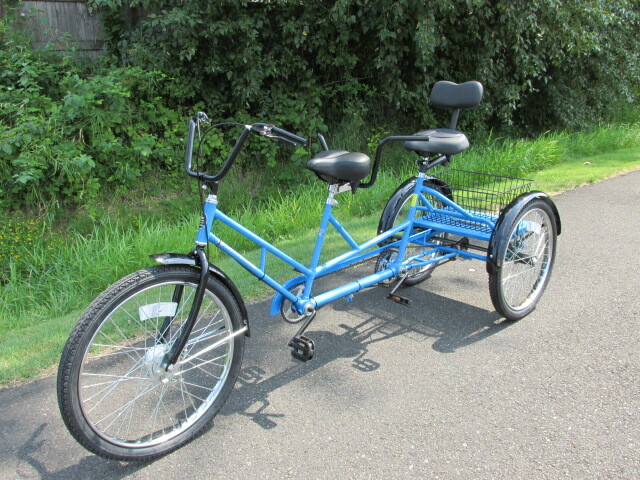 In Line Tricycle Built for Two...heavy duty. 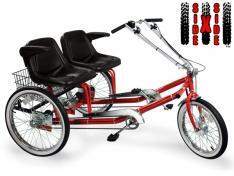 Just like a bicycle built for two with one rider behind the other, but in a tricycle form, the Worksman Tri-Tandem Tricycle is fun, adaptive and durable. This sturdy bike features Worksman Clincher Wheels, with 11 g (.120), Automotive type front drum brake with rear coaster (foot) brake, easy on-off fully lugged frame, Rear basket mounted to steel platform, Smooth riding 26 x 2.125" front tire with 24 x 2/1.25" rear tires, thickly padded saddles, upright handlebars. Besides fun and recreation,many people find this cycle to be useful for therapeutic uses, allowing rear riders with special needs to enjoy the fun and benefit of cycling. Weight capacity 500 pounds.